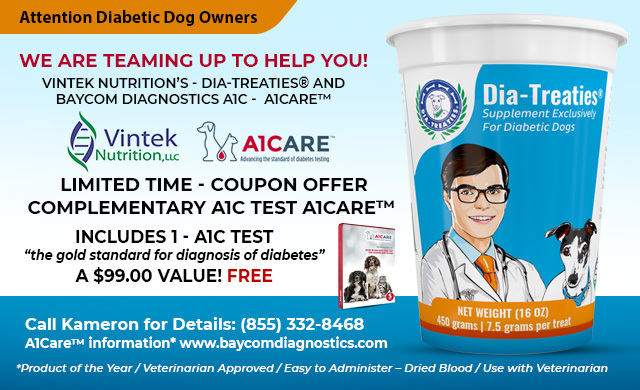 Dia-Treaties® Supplement Exclusively for Diabetic Dogs. 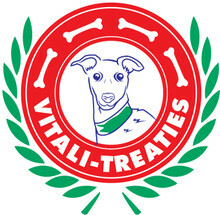 Dia-Treaties® supports the energy and fatty acid needs of dogs. 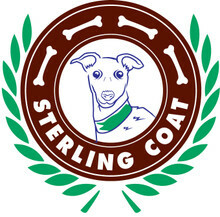 Patented for use with Diabetic Dogs. Never Cooked to maintain maximum nutritional potency. Soft Chewable - Diabetic Dogs generally have dental issues and missing teeth. Vet supervision and the use of a glucometer is recommended to prevent hypoglycemia. Diabetic symptoms include: excessive thirst and frequent urination, weight loss despite a voracious appetite, bladder infection and cataracts. Your pet's safety is paramount. All our products are manufactured in an the USA. Over 25 years of experience supplying the world's leading animal health companies. Comprised of all GRAS (generally recognized as safe) ingredients. Treats given based on twice daily insulin injections. Do Not Exceed Recommended Amount. *Information presented at vinteknutrition.com is for educational purposes only; statements about products and health conditions have not been evaluated by the Food & Drug Administration. after introduction of Diatreaties. Before he was very sick to the point of sometimes not wanting to eat. He is now doing very well, happy and full of energy. I don't think it's a coincidence. I have ordered 3 or more times now and although I can not yet fully rate how effective the product is, I can speak to the shipping/ receiving. My dog's weight seems to have stabilized and the excessive water drinking has ended...all good things. My first order arrived very broken, but luckily there were about a dozen formed treats so I could roll the others into the approximate amount I thought my dog was supposed to get. My second order was also very broken ( not really your fault probably) but also did not have the silver-looking foil cover over it, so that one was very dry and shook around into lots of broken pieces in the box. My third order arrived with the foil and a little ice pack and the treats were in very good shape when I received them and not all dry and broken. These have really helped Oscar's diabetes. However, the latest shipment was soggy and mushy in the bag, making them stick together. Usually drier and easier to separate. But, my dog still loves them. Thanks for letting me know. We are aware of the last batch and have fixed the issue. Thank your for your understanding and input. Please call (855) 332-8468 if you have problems and we will fix them. So Glad We Heard About Dia-Treaties! Our Riley loves these treats and they have helped so much in stopping the need to give him more and more insulin. He has more energy and looks very healthy again. Hope to have him with us for several more years! I am happy to review Dia-Treaties. Soon after our dog Mabel was diagnosed with diabetes I found and ordered your product. It arrived promptly and the packaging was excellent. The cold packs were still cold! We started on the treatment straight away and Mabel”s condition began to improve almost immediately. She gained the weight that she had lost.Her blood sugar levels are perfect. And in the words of her vet “she looks amazing!” I cannot recommend your product highly enough. Mabel looks a picture of health. Her coat is sleek and shiny, the best it has ever looked and she loves her Dia-Treaties coming straight to the frig after her injection to get her treats. Thanks so much for a great product. My pooch won't touch these treats so I can't make a real review. I tried numerous times to get him to have one but it was a no-go. I even tried crumbling them up in his food but he very carefully ate everything but the treat bits! I guess he didn't like the smell of them... I had high hopes for these working well and reducing his need for insulin but it wasn't to be. I have the whole bag still sitting in the fridge. Max loved these.I gave him one after his meals.His favorite treats! I very much like my treats, makes me forget my pokies when My owner checks my sugar level. I look forward to my injections because I get my treats afterwards. I have notice that my high points of my sugar levels have come down from 450 to 240. I have gain more weight and my vet has told my owner that I am doing just fine. Thank You So Much Boo Boo. My dogs blood sugar Stabilized and her insulin requirements went down, plus she loves the treats.